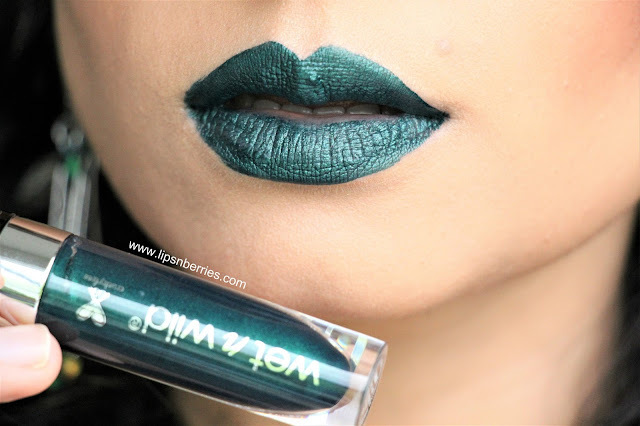 Wet n Wild Midnight Mermaid Collection- Swatches & Review | LIPS n BERRIES! I'm a little bummed about publishing this blog post. 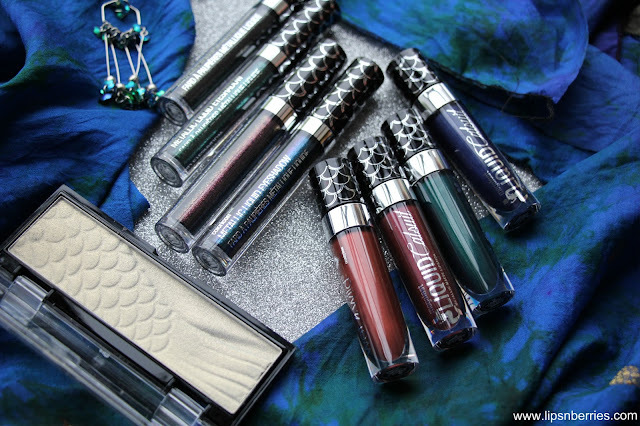 I just found out that this limited edition Wet n Wild Makeup collection is off the shelves at Farmers NZ this week. It was here for just a month! So I was in a dilemma whether to post about it or not. I've decided to go ahead with it as it's still available in other countries (US) and might pop up on some online shops and discount stores as well. Wet n Wild Midnight Mermaid Collection is sparkles galore. 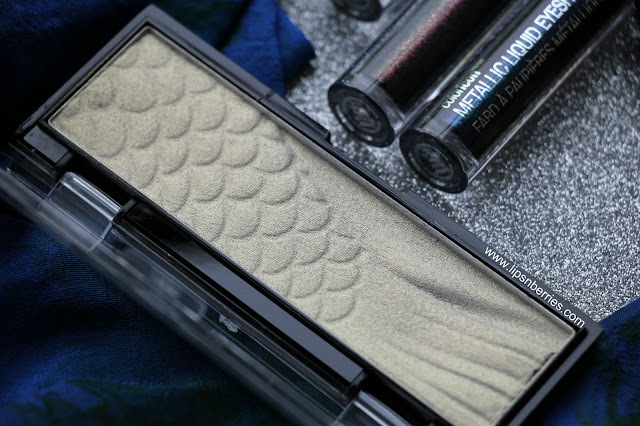 True to its name, the collection is actually mermaid worthy. The colors are rich, duo chrome shine is a feature of every product and the finish is metallic at best. 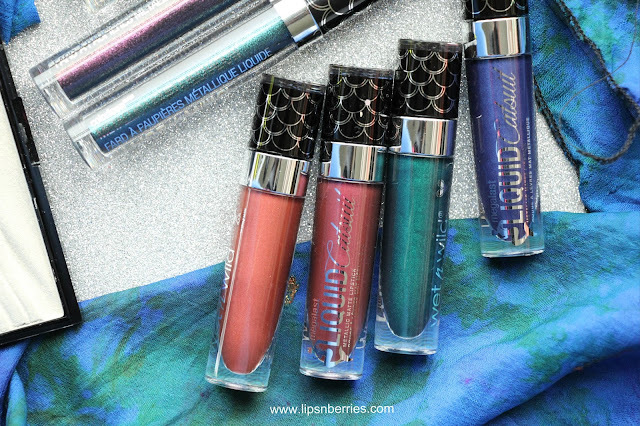 The collection has 4 x Megalast Metallic Liquid Catsuit Lip Colours ($12.99 NZD), 3 x Megaliner Metallic liners, 4 x Color Icon Metallic Liquid Eyeshadows ($12.99) and a Megalast Highlighting Bar ($14.99). 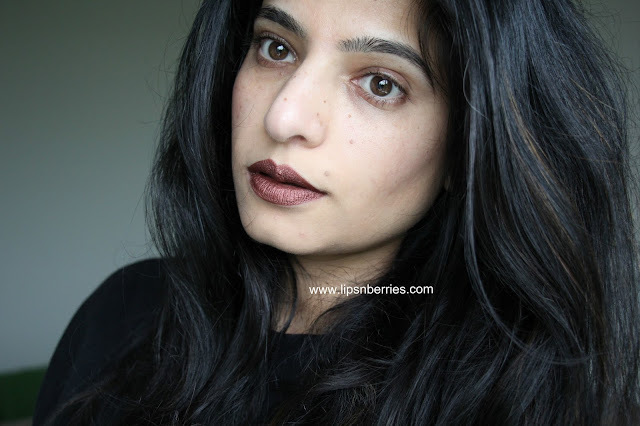 This liquid to matte lipstick formula has to be one of the best I've tried & I've tried a fair few. 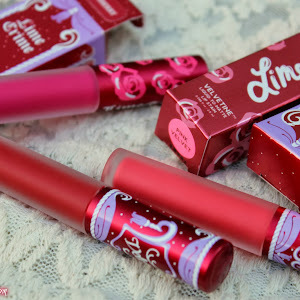 The formula is not very thin, pigmentation is opaque, wear around 4-5 hours and finish a comfortable matte. 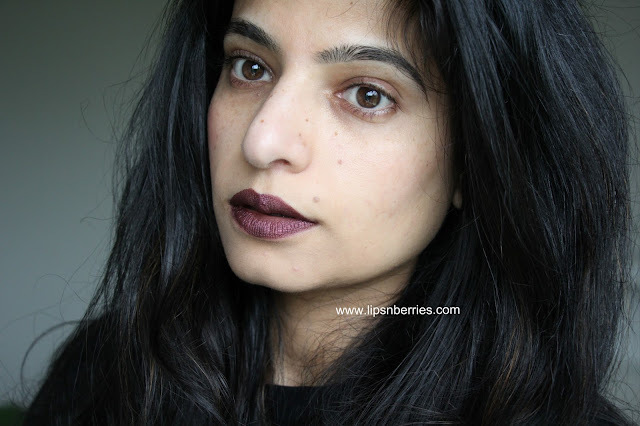 I swatched all 4 lipsticks on my lips one evening and was surprised at how well the lipsticks held on my dry lips. Transfer is minimal and once set the shades don't budge. 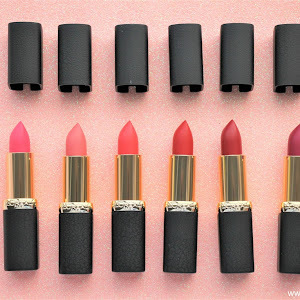 I'm definitely going to check out Wet n Wild's Catsuit Lip Colour formula in their permanent range. 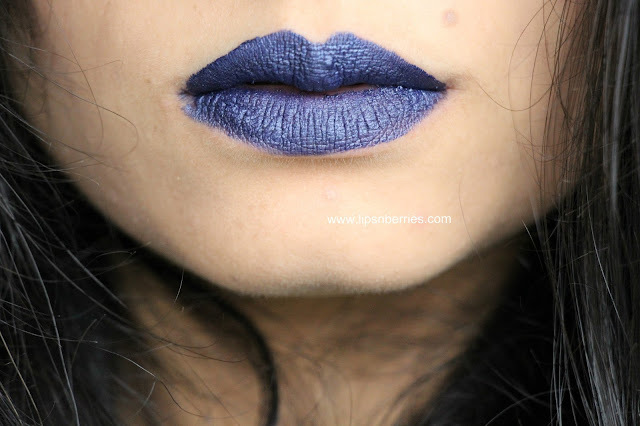 The 4 metallic shades in Midnight Mermaid Collection are stunning. 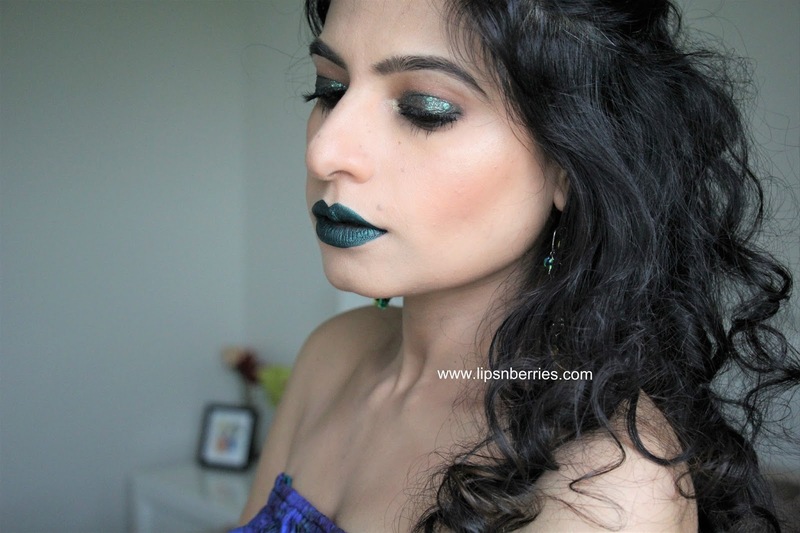 I fell head over heels for the green lipstick called 'Siren's Jewel', so much so I wore it out for a public event. Needless to say I got my fair share of awkward glances. 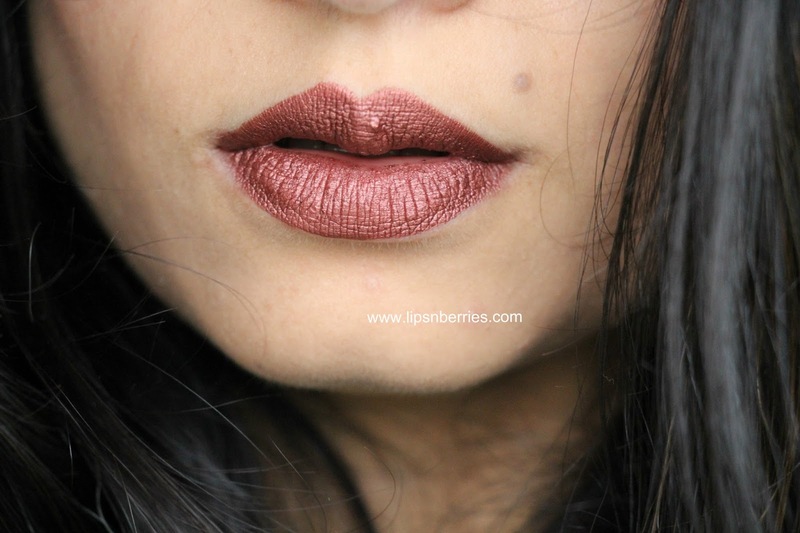 Coral Crown is an opaque metallic copper lipstick with pearly sheen. 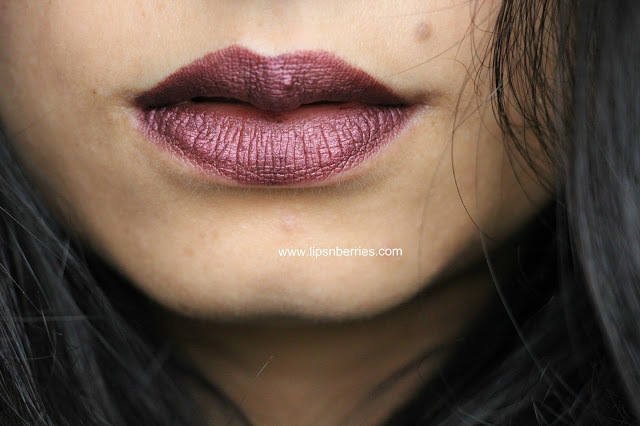 Harbor A Crush is an opaque metallic burgundy liquid lipstick, which is probably the most wearable lipstick shade in this collection. Siren's Jewel is deep forest green and has pearly sheen to it. 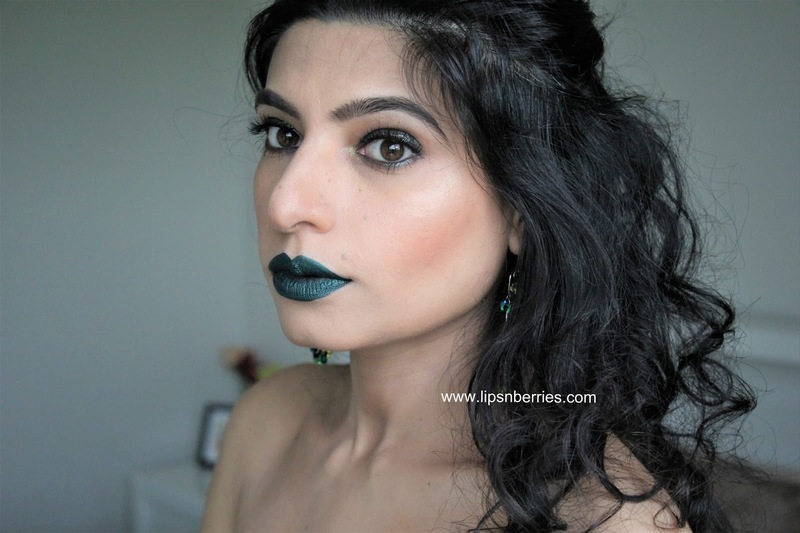 If you love green lips, this one is a must have. 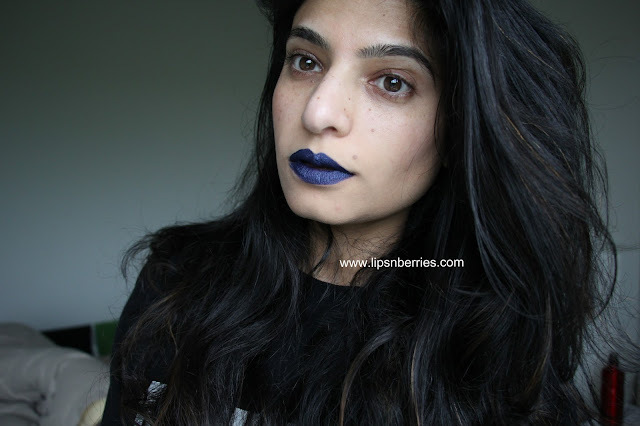 Sea Seduction is an opaque deep indigo blue liquid lipstick with very finely milled silver & blue glitter (looks more like sheen). I can't fault these liquid lipsticks. A highlight of this collection for me! Every makeup addict on Instagram would agree that Metallic eyeshadows and specially the ones that are heavy on glitter take an eye makeup look to next level. 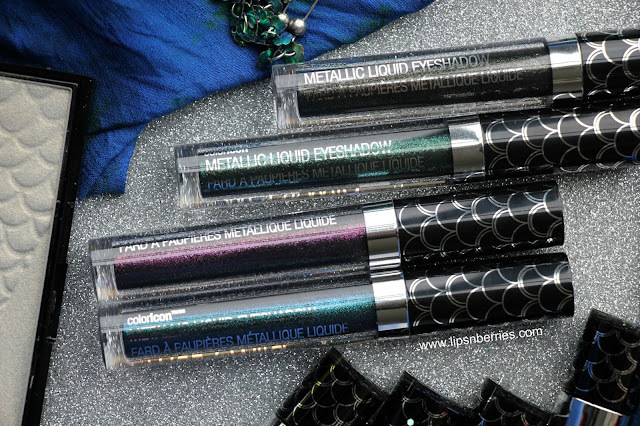 These Metallic liquid eyeshadows are still a novel product for me and I'd admit that I haven't sussed the formula yet. The eyeshadows are very similar in texture to Australis Metallix cream eyeshadows. 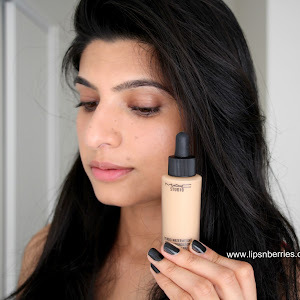 The formula is creamy, non gritty and spreads evenly. It is best used with fingers. When first applied, the eyeshadows tends to move if you touch it or try to layer it (as I did!). It's best to have a powder eyeshadow underneath and then top it with a swipe of metallic liquid eyeshadow to make your eye look stand out. Once set, the eyeshadow doesn't move. It stays for a good few hours. They don't feel heavy or tacky. My only concern with these is that you have to be careful to not go overboard as it can flake off if piled up. If you stick with a single layer or two, they go nowhere and look stunning. The shine is unreal! Mysterious Nights is liquid black eyeshadow with very fine multi colored glitter. It couldn't have been named anything but 'Mysterious Nights'. So Stunning, whether applied thick or sheered out. 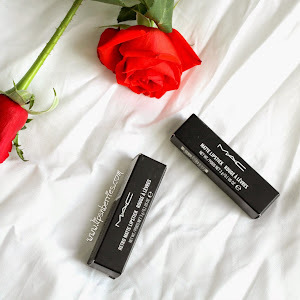 This can add a new dimension to your black smoky eye. Lara's Necklace is green eyeshadow with duo chrome glitter. This is the one I have on my eyes in the pictures. Moonlight Majesty a beautiful purple glitter eyeshadow that is super creamy and shiny. Love! 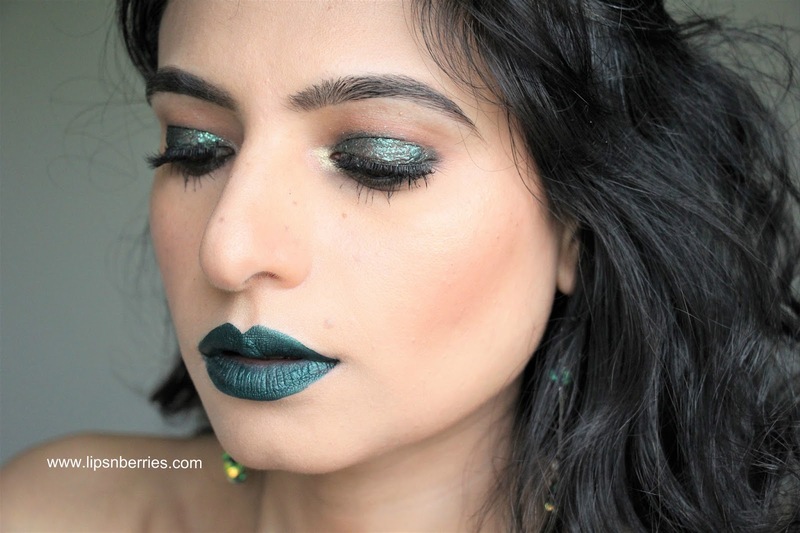 Aquatic Prism is a stunning peacock green eyeshadow (almost teal). 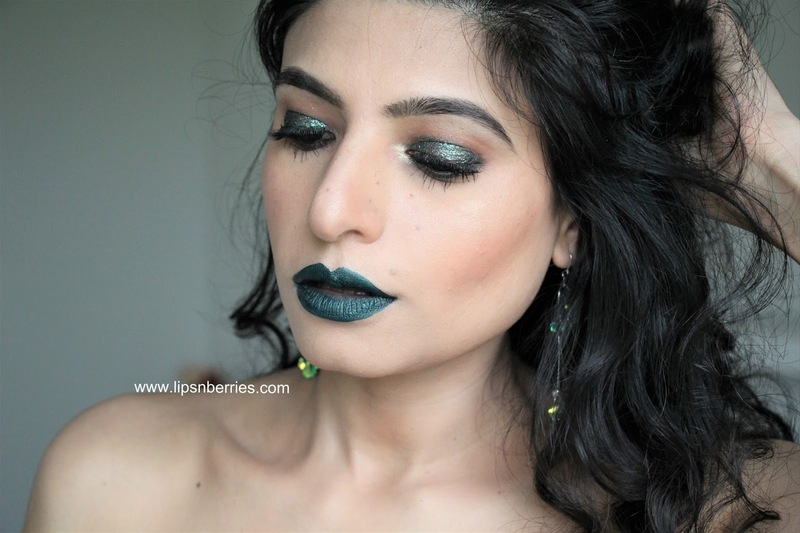 It's the most stunning from all 4 shades, though I can't say if its the most wearable of all. I am excited to put this one on my eyelids. Might try using it as eyeliner as well. Just look at the packaging. The mermaid tail impression on the highlighter bar looks absolutely gorgeous. The highlighter is pearly gold. I love it! Its almost like my favorite Makeup Academy Undress Your Skin Highlighting powder 'Iridescent Gold'. It complements a lot of makeup looks as the powder is not too warm. I wish it was more finely milled though. The powder stays for 4-5 hours on my dry skin. I have it on my cheek bones in the photos below. 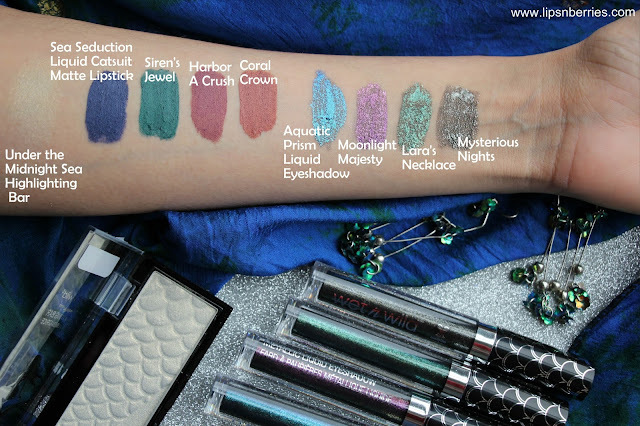 Midnight Mermaid Collection is a dream! There's nothing that disappointed me. The price point is very attractive too. Disclaimer: Products sent by brand for consideration. My views are honest as always.